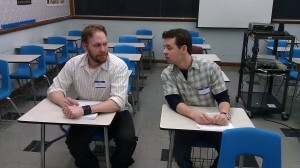 Getting ready to teach an improv workshop w/ Eric Bays! A busy month has passed since my last post. Apart from directing a play, which I’ll get to in a moment, this has actually been a big month of “firsts” for me! I went out for my first general audition at Second City, and it went pretty well! I made what seemed like a favorable impression on a couple of big names in Chicago improv and sketch comedy, so I view it as a huge success! I auditioned for my first national tour, and even managed to get a callback! It was one of those breakdowns that you see on ActorsAccess and you’re like, “Well, I’m not sure I’ve got the chops for this one, but I’ll submit anyway.” Boy, am I glad I did! I ultimately didn’t get cast, but the experience taught me a ton about myself and my audition preparation! I taught my first improv workshop! As part of a fund-raiser for my theatre company, The Consortium Project, myself and other company members taught a series of theatre-related workshops at a high school in the suburbs of Chicago. It was such an eye-opening experience for me! I had never viewed myself as a leader; I’m at my best when taking direction from others. But the role of “teacher” came naturally to me, and I wound up having loads of fun! It’s something I’m strongly considering doing again in the near future. And on top of it all, I’ve been lucky as hell to be directing an incredible cast of actors for the world premier of Rotten Couch Potatoes, a one-act by Chicago playwright Amy Whittenberger. I cannot begin to express just how much they have taught me about the art of acting. By helping these actors discover their characters, it has opened my eyes to approaching character work for myself. By analyzing a script inside and out, I have learned how to recognize key moments in a character’s story arc. Above all, the process has cemented what I already knew: creating theatre from the ground up is a collaborative process. Each one of us brings something unique and creative to the table, and, if we combine those abilities, we create these incredible works of art. I realize that this post is a lot of “me, me, me,” but I really wanted to share it with you guys. It’s one thing for us to sit here and say “create your own opportunities,” but it’s pretty damn awesome when it actually starts to come together! Try it!